Apple has revealed the iPhone 6 at a launch event in California and, as expected, there are two different sizes of the new flagship device. No single piece of consumer technology generates as much chatter as Apple's iPhone and this evening CEO Tim Cook gave us our first official look at the latest version. Even though every shred of information on the handset has been discussed online, the undeniable impact of new Apple kit is in full effect. As expected, the new iPhone 6 comes with the heavily tipped 4.7-inch display that will see it go up against the likes of the Samsung Galaxy Alpha, the HTC One M8 and the LG G3 for the smartphone crown. Apple hasn't stuck with just the one iPhone this year either as, like last year's iPhone 5s and iPhone 5c double launch, the company also announced the iPhone 6L this evening. “The iPhone is the most loved smartphone in the world with the highest customer satisfaction in the industry and we are making it much better in every way," said Tim Cook. Given this is the company behind the Retina Display, there's obviously a lot of love that's gone into the iPhone 6's display. Cupertino has upped the resolution to 1334 x 750 - an improvement over the 1134 x 750 of the iPhone 5S. Rather than Gorilla Glass, Apple has used an "Ion-strenghtened glass" to keep scratches and cracks at bay. 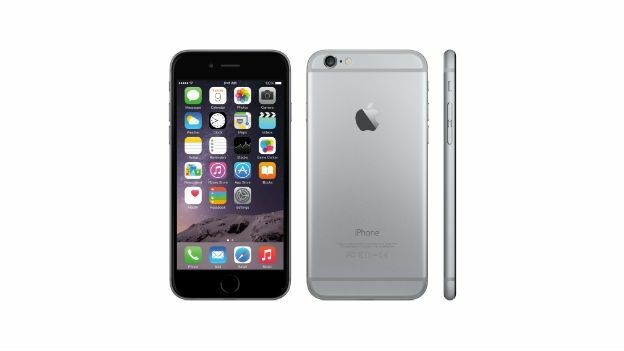 Outwardly, the look of the new iPhone is a departure from last year's 5S. The rounded corners bear a similarity to the iPad Air and iPad Mini, while the power button has been moved from the top of the unit to the side. As expected, a new 64-bit A8 processor is tucked into the iPhone 6 which, Apple says is 13 per cent smaller than last year's A7 but is 25 per cent faster. Alongside this is the new M8 co-processor with a particular emphasis (as with the iPhone 5S before it) being placed on fitness and the ability to measure elevation. There's been a bit of a change on the storage front though. Along with the standard 16 and 64GB variants, Apple has finally introduced a 128GB model for those with a serious appetite for apps and media. It's a no-show for the 32GB model. When it comes to the camera, it's business as usual for Apple as the company has stuck with the 8MP rear-facing iSight camera with am f2/2 aperture and True Tone flash. However, the company has added a new sensor that, it says, offers up faster autofocus and improved noise reduction. As revealed in the leaks, the camera lens protrudes slightly from the back of the chassis and (also rumoured pre-launch) Apple has built in electronic image stabilisation. Video can be shot at Full HD as well. Apple's big features from past handsets: TouchID, Siri and Passbook are all accounted for this time around and the company has finally taken the plunge and added Near-Field Communication (NFC). How the new iPhone measures up. The iPhone 6 will unsurprisingly come running iOS 8, the new version of Apple's mobile operating system that we got a good look at during WWDC. While the flat design of iOS 7 is still in place, there are several new features like time-lapse camera shooting and the ability to sync SMS and phone calls with a MacBook or iMac. One of the best aspects of an Apple launch is how quickly the company is able to get the device out and into all those waiting hands. This year proved no exception. The iPhone 6 will go up for pre-order on September 12 and be available on September 19. Available in three different colours, the traditional silver, black and gold, the SIM-free price of the iPhone 6 will be $199 for the 16GB model, $299 for the 64GB and $399 for the 128GB. Stay tuned for our initial hands-on review of the iPhone 6 from California and our full-bore T3 review coming in due course. You can let us know what you think of Apple's latest offering via Twitter or on the T3 Facebook page.